I wouldn't be surprised if the devs of GRIDD:: Retroenhanced (Antab Studio/Kongregate, 2017) mentioned in a few months how the Switch release sold more than the other platforms combined. Hand up if you knew the game released on PC in May 2017? Or XBoxOne in July 2017? 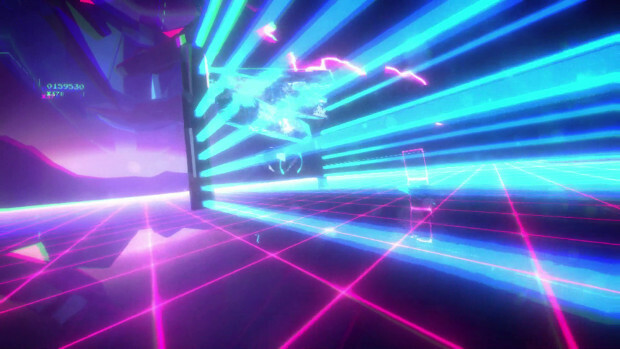 The static screenshot should tell a lot of what to expect: 80s Tron-like visuals, electronic music (this time by DreamFiend), chromatic aberration and on-rails shooting. Stylewise, the game is pretty spot-on. The 8086 instructions pop up here and there, the music is pretty nifty (although there's apparently only four tracks in the OST) and the fluorescent colours will the screen. 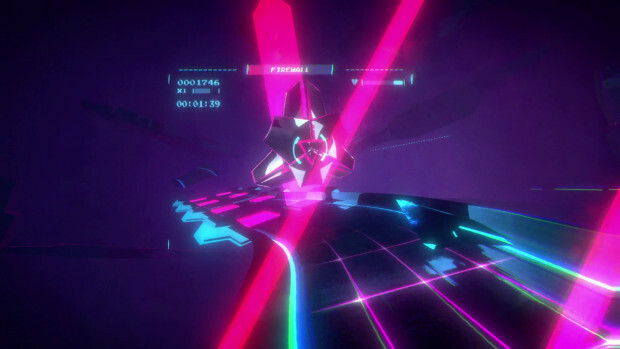 The game is also laid out in an "old-school" way: to unlock the endless mode, the player needs to finish the arcade mode first. Finishing its three stages takes maybe 30 minutes... if the player manages it on their first try. There are no continues and the only way to get an extra life (a backdoor) are the challenges between the levels. The game doesn't explain those at all, but then again, they're pretty self-evident after a few tries. The arcade mode itself is a straightforward affair. There are no instant death scenarios that I could notice, and both important game mechanics (violet beams hurt, shining metal surface reflects shots back) are communicated clearly even when going in blind. The only weapon the player has is the peashooter, but it can be upgraded to be more powerful. There are no homing attacks at all, but the autoaim on the regular gun is strong -- maybe too strong, as it likes to just as easily change its aim to reflective enemies as they speed towards the screen. And then we get to a big problem in the game: the camera. To highlight the issue, the screenshot above is from late in the arcade mode: the player's ship is between the laser barriers, as far left as it can go (the three squares tell that). 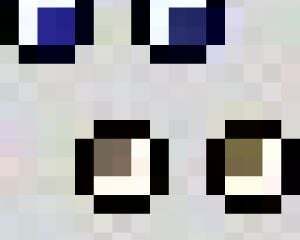 The player has no control over the camera. The way the game handles the camera means collecting the powerups (health, shield, weapon upgrade) is more difficult than it should be. Sure, the camera makes beautiful shots, but those viewing angles often aren't ideal for actually playing the game and having visual help in placing the player's ship in relation to the ground. Of course, this is made even more difficult when the player can fly out of the picture altogether in at least one situation. The ship flies on the track, but the track is way off to the side of the screen... as are the damaging beams the ship is flying between. The arcade mode doesn't take long to finish, probably only 2-6 hours. Yet, that mode would be better labeled as "tutorial", as finishing that unlocks the endless mode. GRIDD does the intro part better. There were no "what am I supposed to do now?" moments unlike I had with S:A's final boss. GRIDD can also conceivably be cleared on the first go, unlike S:A, where the power needed to defeat the boss can be unlocked only at defeat. The endless mode is much more difficult than the arcade mode. Like the arcade mode, it is split to levels with a chance of earning extra lives between them, but the time limit is tighter. The time beating the arcade mode was for me 22 min. The best I've done in the endless mode? A bit over six minutes. 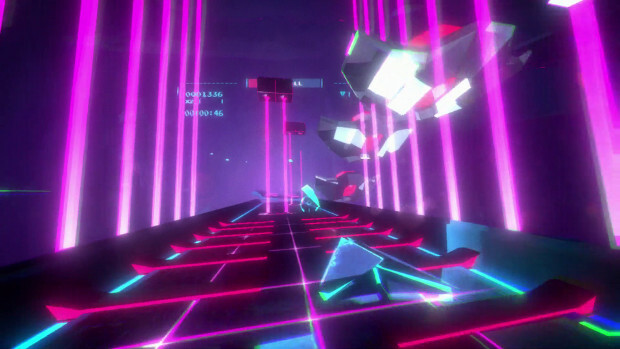 While the levels in the endless mode contain many elements the arcade mode had, the endless mode introduces more obstacle types. So far, the runs I've made in that mode have not been identical, so I would imagine the levels are procedurally generated. Yet, the arcade mode comes across as by far the better one. The backgrounds foreshadow what's to come and most importantly, midbosses and environmental hazards typically don't happen simultaneously. The level generator for the endless mode really needs a thorough tune-up or even a rewrite. If the player fights against a midboss flying high, which is also where the camera focuses, then having to fly low to see where the damaging energy beams are is not a good idea. Controlwise, the Switch version offers three options: both joycons or a pro pad, one joycon held sideways or the "glove of power" mode, which is more of a novelty mode than anything taken seriously: in this motion-controlled mode, the player holds the controller in their fist, uses the Zr/Zl button to shoot and the position is read by the joycon angle. Given how sensitive the controls are, I don't think this is a viable way to play the game. However, I should point out that NintendoLife's pre-release article on the game mentions something about adaptive difficulty. The problem is that I don't see any mention of that in the game, in eShop, and I don't know how well the highscore-hunting would work with such a feature if it were present. I think it works with Nation Red (Diezel Power, 2009), but that is a far simpler case than this. That game also makes the difficulty level user-specified. There's also some bugs. The game likes to show up an error message when finishing a run. It doesn't completely crash the game, but that's something the game doesn't need. Sometimes it works, sometimes it doesn't. I also don't know if subbosses are expected to follow the player through the firewall portal, but I don't think they should. Or have the same boss fly through a wall of cubes that the player needs to create a hole in, although this can also be attributed to a poor procedural generation of levels. All in all, I'm disappointed. The short arcade mode was fun to play, but the unlimited mode not so much, which raises the question if the game is worth the asking price. On a plus side, the game takes only 134MB on my Switch.